This Food Friday is A-W-E-S-O-M-E! Probably my favorite. I love love LOVE guacamole. I love authentic guacamole, not the crap that's vacuum sealed in a container at the grocery store that has the consistency of soup. Nope. Not for me. I like chunky guacamole. Homemade. Or made right in front of me. I want to see the limes and avocados. Smell the cilantro. My mouth salivates just thinking about this delicious treat. This recipe lasted us for quite a few days during which we consumed some every day. I am in love with my new camera which has been severely over used since I got it. Ah well. Better to use than not use that little giant investment. Peel, pit, and mash the avocado. This part is my favorite. 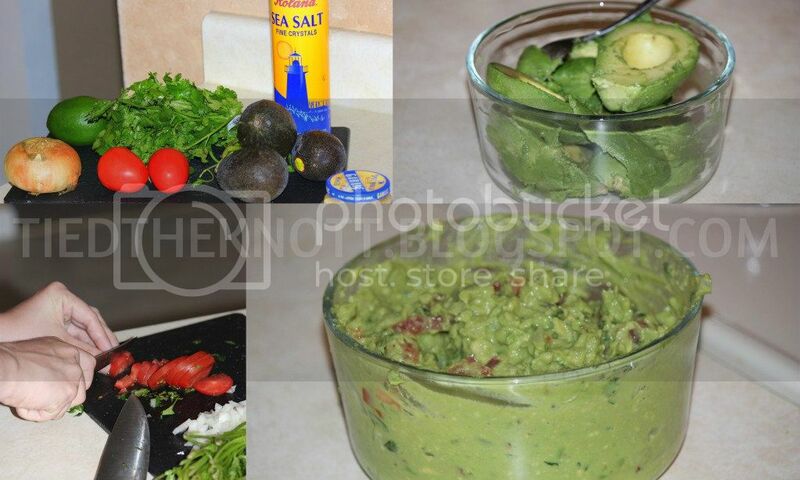 Slice one line all the way around the avocado (using the pit as a guide) and use your fingers to separate the pieces. Pull out the pit. If it is a tough one, use a spoon. Using the same spoon, scoop out the whole avocado from the skin. Place in a bowl and mash the avocado pieces together (I used a mini whisk... worked like a charm). Juice the lime (whole thing). I juiced it through a small mesh strainer so I wouldn't get anything but juice in my masterpiece. Mash together lime juice, avocados, and salt. Add onion and cilantro. Dice the tomatoes into small(er) portions so they don't make scooping the dip tough. I cheated on the garlic and used the stuff in a jar. I love LOVE that stuff. Mix the ingredients all together and serve! Let me know if you give this baby a try. It's a great, colorful summer appetizer. I could eat guac everyday! !